ATTENTION: You are currently not logged on as a trader. This means you may browse the store, but to purchase trade items you must apply to become a trader. Alternatively you can browse our retail gift shop to make purchases. 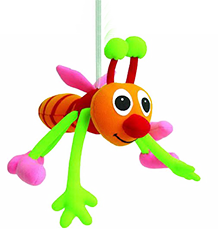 ATTENTION: These colourful springy mobiles are not toys but for decorative use only. They should be hung out of reach of children, not directly above cot or child's face. Use for visual stimulation and a distraction at nappy changing time etc. Please fill out the form below to apply to become a trader of Panopoly Giftware.